Will My Room Dividers Withstand A Beating? If you are looking for a room divider your main goal is most likely to divide and conquer! No matter what you’re looking to do, hide junk, create two separate classrooms or provide privacy, Screenflex Room Dividers can help. It’s important to know that the divider you choose will be flexible and durable. Let’s face it, you want to get the most out of the room divider you buy. Our dividers are kid friendly and stand up to everyday life in your classroom. This video shows how easy it is to set up a divider during class time. Our room dividers take a beating. For extreme heavy-duty use, try our heavy-duty room divider line. Even though our room dividers are easy to move and roll right where you need them, don’t let them fool you. 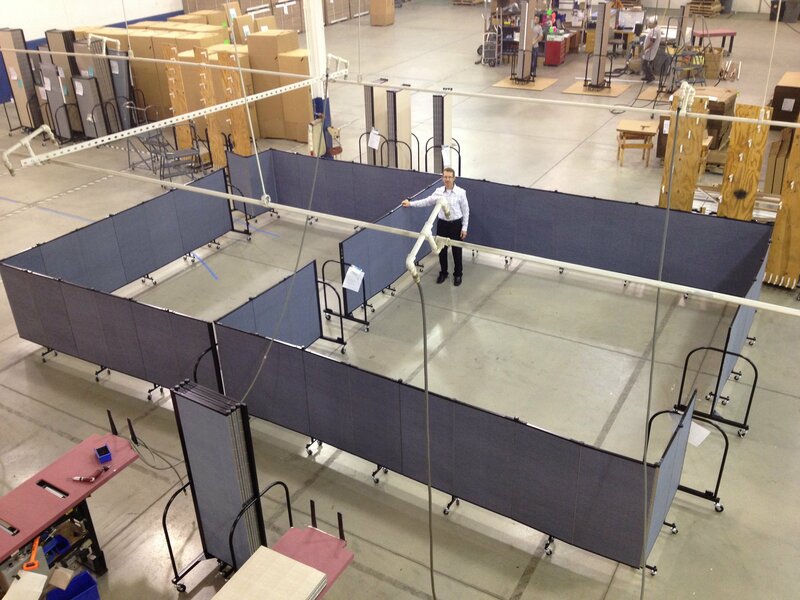 Screenflex room dividers are tough and sturdy. Our most popular divider weighs about 150 lbs. even though it doesn’t feel that heavy. Stable and sturdy dividers with a powder painted steel end frame and lockable casters. 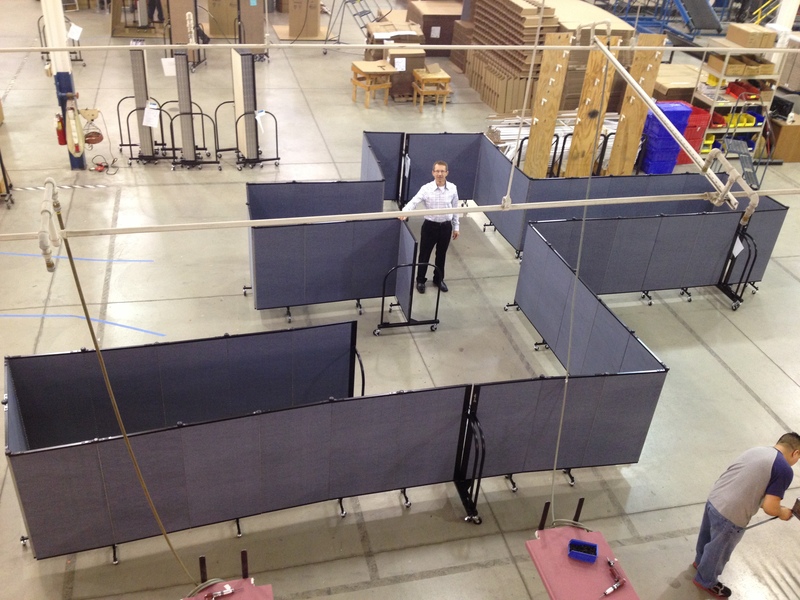 Screenflex room dividers are tough enough to stand up to years in your classroom, fellowship hall, office or airport. Just four room dividers in this photo are very flexible as they create bends and turns between panels. Create various shapes or just one straight line to divide your space. The same 4 room dividers can create two large rooms for preschool or daycare. I like the lower walls to allow teachers the ability to see the entire room while kids stay focused in their separate areas. The approximate dimensions of the two rooms are 8′ x 18.5′ and 18.5′ x 18.5′. You can create any size desired. If you have specific needs, try our free planning service. Your dividers will fold up quite compact! 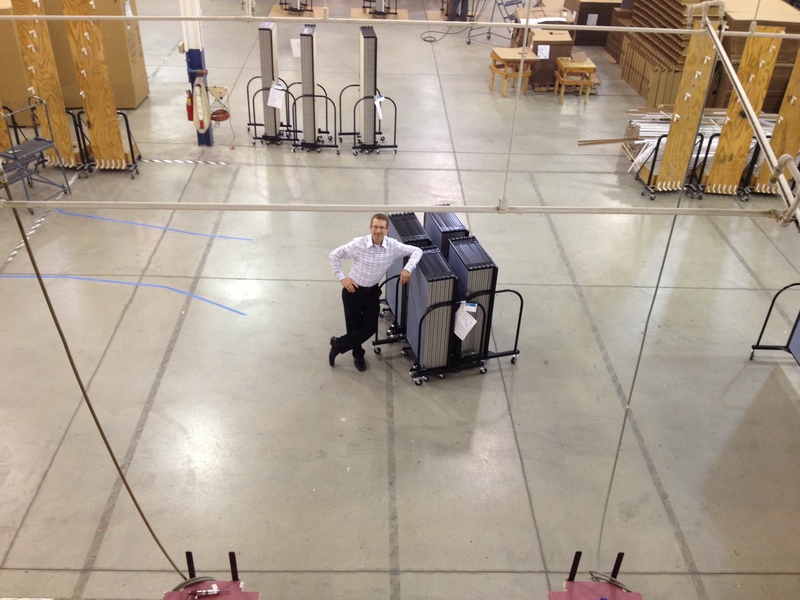 Take a look at Steve standing with the same 4 room dividers that created about a 40′ x 20′ box. Each divider is approximately 2′.6″ x 3′. They nest together for even more space savings! It is amazing how small each divider can fold up closed. One of my favorite stories is this one about Mike Brown. Mike has been using Screenflex for about 15 years. Here’s his story: Great Testimonial About How Screenflex Dividers Holds Up After 15 Years Of Constant Use.